The BangonSugBohol movement was started after a massive 7.2 earthquake struck the Cebu-Bohol area last Oct. 15, 2013. The island of Bohol suffered major damage to properties and infrastructure after Intensity VII tremor . Some bridges were destroyed causing a great difficulty in delivering relief to victims of the earthquake in some towns. Some buildings in Cebu were also damaged but it pales in comparison to the degree of destruction in Bohol. The BangonSugbohol movement was started by several civic organizations based in Cebu to help the vitims of the Oct. 15 earthquake. The movement has already raised thousands of cash and countless of relief goods that has helped the Boholanos. They held a charity concert last week which raised a lot of money and they will hold another one today at SM City Cebu. One way to support the movement is to buy #BangonSugBohol shirts. These shirts can be bought during the benefit concerts. It is also available at the different Island Souvenir Branches in Cebu. Part of the proceeds of the sales of these shirts will be used in the movement's different programs to help the areas affected by the earthquake. 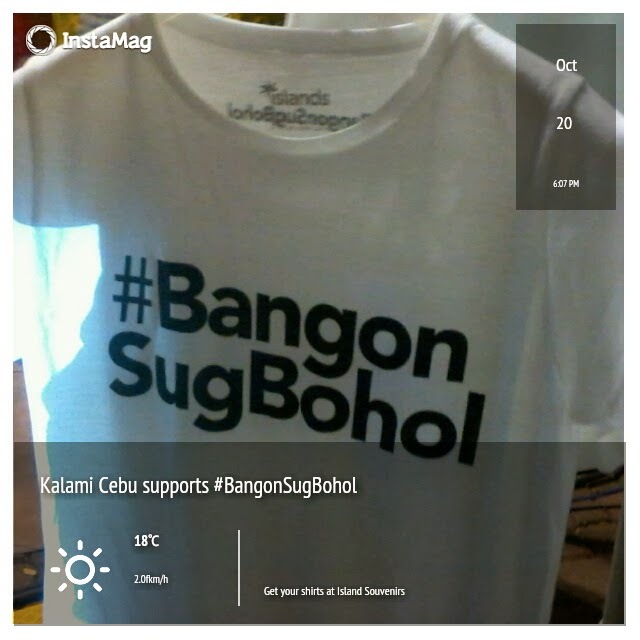 Buy your shirts now and help #BangonSugBohol. Shirts starts at Php 200. Island Souvenirs have branches in Ayala Center and SM City Cebu.